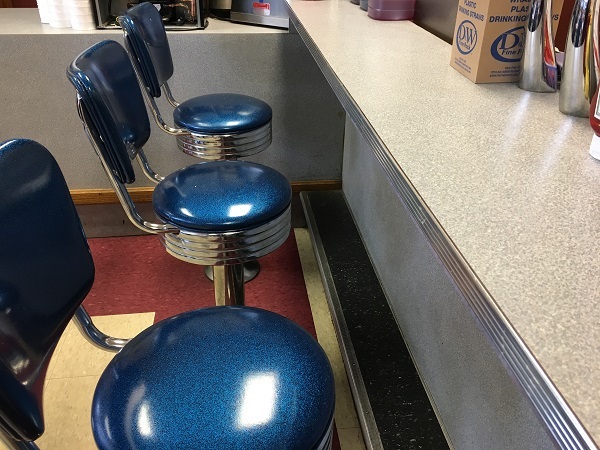 Jefferson Soda Fountain, Oak Ridge TN – Marie, Let's Eat! 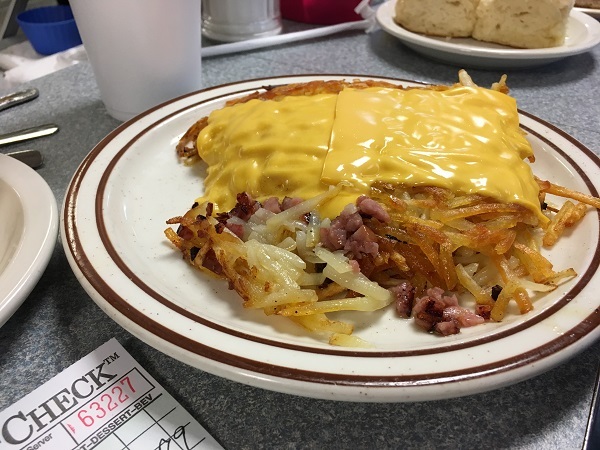 Earlier today, we took a day trip to the Knoxville area, and had breakfast at a place where the scientists and servicemen who worked on the Manhattan Project may well have enjoyed breakfasts while they worked on the atomic bomb. 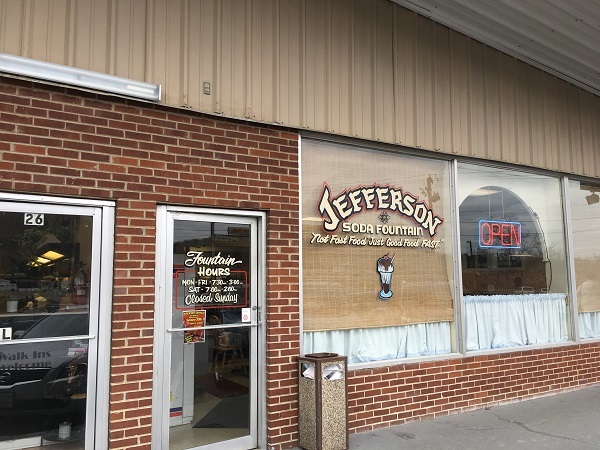 The Jefferson Soda Fountain opened in what was then one of America’s three “secret cities” in 1944. You may have noticed we haven’t written anything here for ages. Life, for several years, had been built around travel and exploration, but – and I won’t burden you with details – we have not had the disposable income to travel and explore. Moving to Tennessee has meant a massive restructuring in how we spend our money, and, until things change, it’s simply been impossible to spend like we did when we lived in Atlanta. And since, with only a couple of exceptions we may be inspired to write about one day, we haven’t found any more places in Chattanooga that have demanded us to share them with you since we paused three months ago, there just hasn’t been anything to say about food lately. We certainly have some favorites that we enjoy a lot, but we’ve written about them already. We’re coming up on the anniversary of our year’s membership to the Creative Discovery Museum, and since our son is acting like he’s aging out of it, we’re probably not going to renew it. That meant that we need to use the reciprocal membership to other museums before they expire. I also learned that my all-time favorite bookstore, which closed up about nine years ago, had reopened. So I started sticking twenties in the shoebox and, this morning, we drove up to Oak Ridge for breakfast. The Jefferson Soda Fountain reminded me of a lot of other great southern pharmacies with a counter and a restaurant, like Dinglewood in Columbus GA or Hoskins Drugs in nearby Clinton TN. 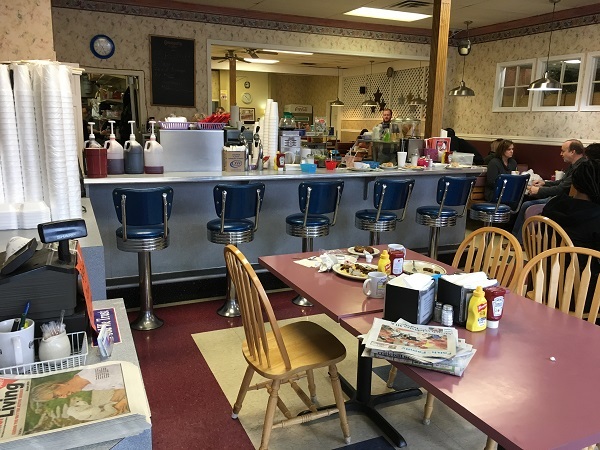 It opened in 1944 and has a counter with swivel chairs and a big mob for Saturday breakfasts. They have a pretty popular burger named after one of the original owners, Myrtle. They also have a bigger one called Fat Man and a smaller one called Little Boy. Lots of businesses in Oak Ridge pick up on the World War Two origins of the city for their names. We saw a credit union with an atom logo and a restaurant called Atomic Bar and Grill on our drive. You can even get a Y-12 Breakfast Bomb combo here with two eggs, bacon, sausage, grits, and biscuits with gravy. If you aren’t sure what Y-12 or K-25 or X-10 are, look ’em up. The Children’s Museum of Oak Ridge is completely awesome. We spent more than two hours here and our son had a great time, even if he didn’t want to learn anything about the region’s history. It’s more like Early Works in Huntsville AL than any other children’s museum we’ve visited, less about science and more about culture. It’s housed in the old elementary school, a huge place with lots of exhibit space. It’s much bigger and better than the nearby Muse in Knoxville. And as for the rest of the day, we also stopped at Pizza Palace for lunch, because they serve what is still Marie’s favorite pizza, and Full Service in Maryville for some good barbecue. The visit to Pizza Palace was particularly amusing, because we ate indoors this time instead of in our car, and this local man came in and said “Hey, I heard y’all were going to be on the Guy Fieri show!” and one of the fellows said “We were, ten years ago!” The local had never even heard of Pizza Palace before, and got the potted history lesson. They’ve been in the same place on Magnolia since 1961 and the dude never heard of them. He was amazed. You think that’s crazy, I mentioned Zarzour’s to my coworkers as the home of my favorite burger in Chattanooga, and none of them had heard of it. Zarzour’s turned a hundred years old this week. We try to spread the word, but we just can’t reach everybody, I suppose. More some other time down the line. Y’all take care and eat well; we’ll probably have something to say after we go to Memphis in a couple of months. Posted on January 20, 2018 by Grant G.Posted in breakfast, knoxville, tennesseeTagged breakfast, children's museums, knoxville, oak ridge, tennessee. Glad you’re back and posting again. I really enjoy your posts since you’re in a part of the country I’ve never been in. So I can visit vicariously – thanks!